When you’re out on the road, you need a way to wake up quickly so that you can go about your day. While many hotels have alarm clocks for their guest, not every trip is spent in a hotel. 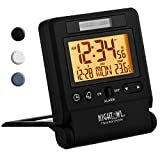 In this situation, you need a good travel alarm clock so that you can be ready for your appointments. 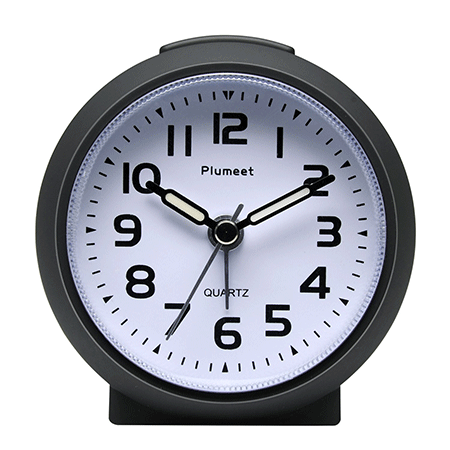 This Plumeet product is a great alarm clock for kids. First, it has a nightlight, which can add a bit of safety to your child’s trip. Secondly, it comes in a very kid friendly color: hot pink. While there is also a black version, the hot pink variation looks great for a child. When you need it to wake up, the alarm has an ascending sound effect so that you are gradually roused. 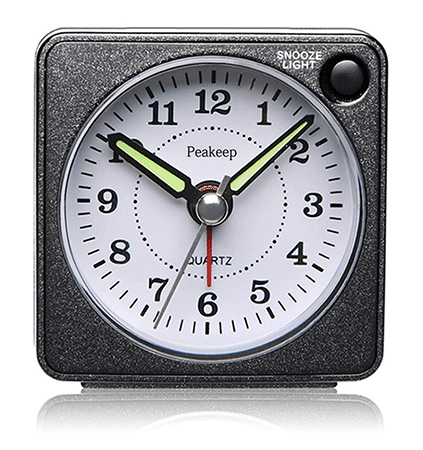 This is an alarm clock that is very travel-sized; it’ll easily fit in any bag or pack. The face is backlit so that there is always some illumination in your room. The snooze works in five-minute intervals. It doesn’t have an A.M or P.M. alarm designation. Sometimes, for an alarm clock, digital is much easier to read when you’re freshly waking up. 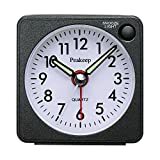 This Airsspu clock has a nice, large face and has several key features that make it ideal for traveling. One of its coolest features is its month and date display that is very useful on trips. Additionally, it has a low light sensor technology that turns on a soft nightlight. The display is very easy to read. It has an ascending alarm tone that gets louder as it rings. 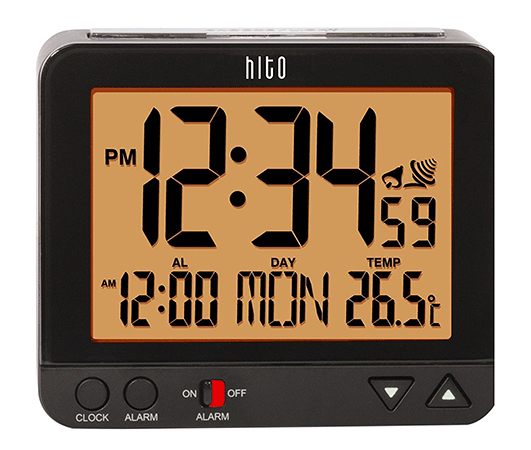 This product even displays the indoor temperature for those cold mornings. It takes a full three AAA batteries. The snooze time isn’t adjustable. For light sleepers, a non-ticking alarm clock is important. This is why this TXL clock is so useful; it is completely silent. Also, when the light is low, its light sensors will pick that up and its face will glow a dim blue. Additionally, when the face is exposed to sunlight, the face will then glow for an additional four hours when it gets dark. 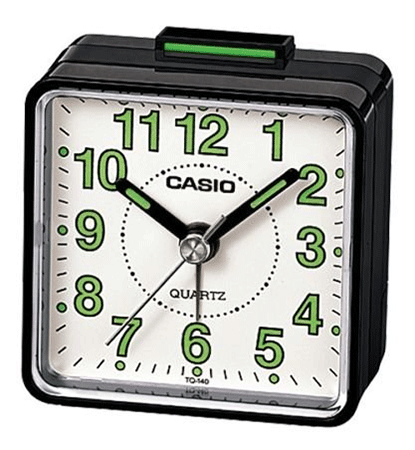 This alarm clock is very accurate due to Quartz movement. For those who need complete silence, this is a great clock. It has a very nice looking, rectangular aesthetic. It almost looks like a watch face. The alarm ascends, but it’s not very loud. This product’s alarm switch is a little too tight. This alarm clock is designed to be foldable so that you can pack it away with ease. This foldability also allows the stand to protect the screen from scratches as well. 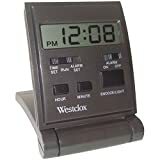 Additionally, for those who prefer military time, this alarm also has a setting to display in either 12 or 24-hour format. Additionally, for the light sleepers, this clock is completely silent. This clock features a thermometer for your room. It also displays the month and the date. This is a nearly flat alarm clock, which makes it very easy to transport and store. It doesn’t have a backlight, which can be useful in pitch-black rooms. Unfortunately, this alarm doesn’t get as loud as you might want. 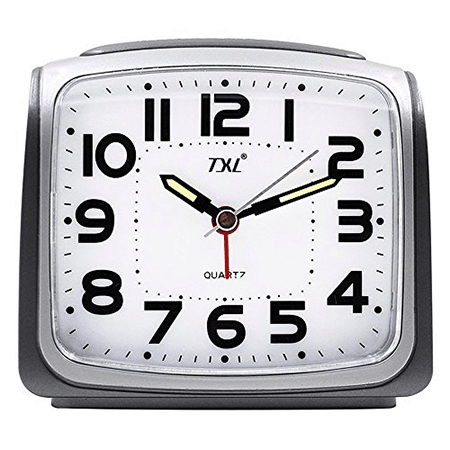 Another great clamshell-style alarm clock, this JCC square alarm clock is designed specifically not to take up a lot of space. Additionally, it even has a backlight so that children can use it ,and you can have a little bit of illumination in a dark room. In addition to this, this clock is also very durable. It’s nice and compact so that you don’t have to dedicate a lot of space to it. It displays the temperature of the room. For those who need to keep track of a date, it also has a calendar feature. It’s easy to accidentally turn off the snooze. If you press the snooze button two times, it turns it off. The backlight isn’t very bright. 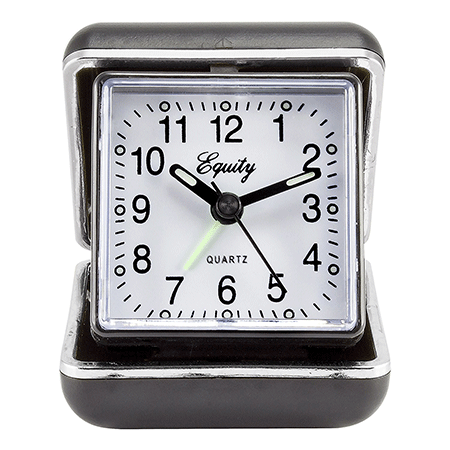 One of the best features of this Equity by La Crosse travel alarm is its ability to be quickly and easily folded back into its carrying case. Despite this folding ability, this clock is actually an analog device that has a beautiful face. It even features quartz movement for accuracy. This alarm has a loud beep for those who have difficulty rising. The hands are luminous enough to be very visible during the night. 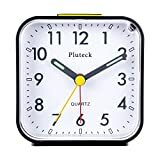 This clock has no ability to differentiate between A.M. and P.M. It doesn’t have a snooze function. 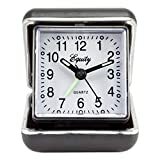 When traveling, it’s nice to have a compact alarm and timepiece that can be placed in a pocket or tucked away in a pack. 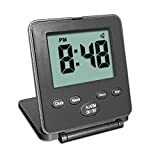 This particular travel alarm clock is designed to be very compact and convenient and is even made of very durable, travel-ready materials. 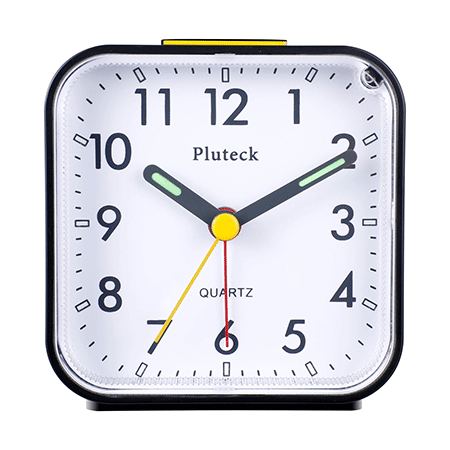 Insofar as functionality, it even has quartz movement for accuracy. It’s very small and compact. It has some great features like a snooze, a backlight, and an ascending alarm. This alarm is completely silent, so light sleepers can rest peacefully. The light only stays on for as long as you press the button. Its alarm is somewhat low. 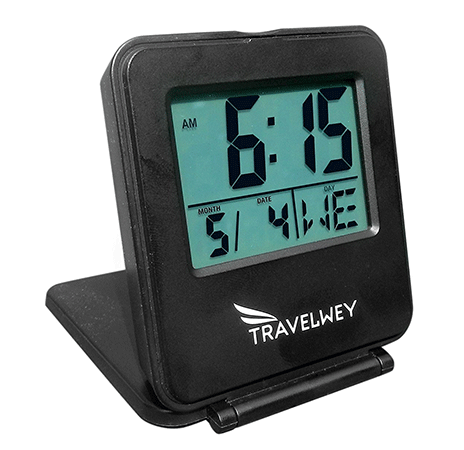 Travel alarm clocks that are foldable provide a lot of benefit during your trips. They can quickly be folded away and the best ones on the market will also be able to stand up using the folding structures. This alarm clock from Travelwey has a lot of excellent, road-friendly features like a date display, a snooze, and an on-demand light. This display is very clear. This alarm clock displays the day of the week. When you need to see the time, you can just reach over and press the light in dark situations. The light only stays on as long as you are pressing the button. The instructions aren’t very clear. If you are looking for an alarm clock for traveling with a unique appearance, then the Casio TQ140 is a great product for you. It has green digits on its analog face that are fairly luminous in the dark. Additionally, it’s small enough for easy packing and its alarm has a respectable volume. This is a very durable alarm clock. It takes a licking and keeps on ticking. It has a very interesting aesthetic design. It’s tiny enough to fit anywhere. This is not a non-ticking travel alarm clock, so if ticking can disturb you, steer clear of this product. While the face is semi-luminous, you’ll need an external light to see it in the dark. It doesn’t have a snooze button. When traveling overseas, it’s hard to keep up with the local time. 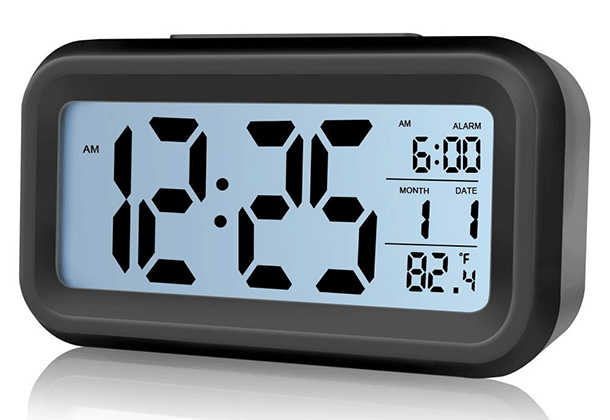 This Hito travel alarm clock can help with this through a radio-controlled system that updates the time automatically. 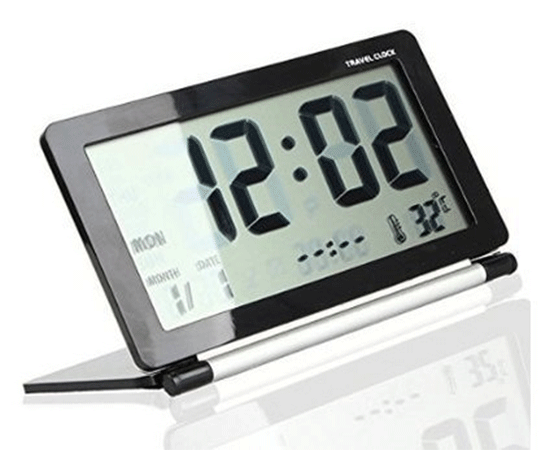 Also, for groggy eyes, this alarm clock has a jumbo display that is easily visible in the morning. It has an auto nightlight that stays illuminated when the light goes low. This alarm tells you the day of the week. The fact that this clock keeps track of time zones is very useful for international business travelers. The radio control key is exposed, so you can accidentally make the clock look for the local time. Its radio controlled feature can bug out in island locations like Hawaii. Even with something as simple as a travel alarm clock, you might want a durable option that gives you a few standout features. 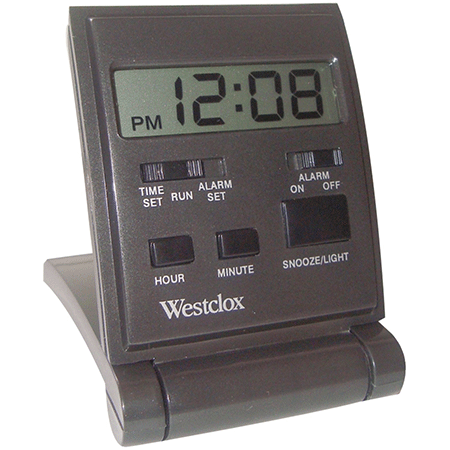 This clock from Westclox packs in some analog buttons that makes operating this product a breeze. It has a larger button for snoozing and a slider that’s designed for both setting a timer and setting the alarm. The timer feature is very useful for when you need to time a meal on the road. Its snooze and light button are nice and large. This clock’s display is very clear and readable. It’s a little low for heavy sleepers. Since this clock slopes upwards, it can be harder to read it from a laying position. 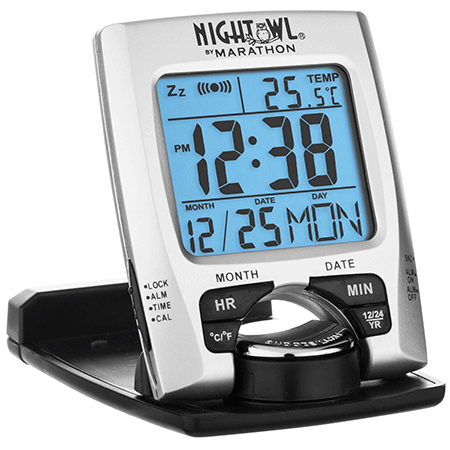 One of the key features of this Marathon alarm clock is its automatic backlight that reads the light levels in the room and activates if it’s dark. It’s also an alarm that has a five language readout, which is nice for some users. Also, as a truly international travel alarm clock, it has settings for six time zones. 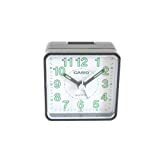 This is a great alarm clock for traveling overseas. It automatically sets, using radio waves, to the correct time zone. It folds down very neatly. 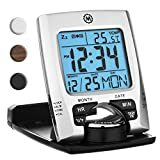 For it to receive time information, you’ll have to place it in a window or another place with an uninterrupted reception. Marathon makes a great travel alarm clock and the CL030023 is no exception. 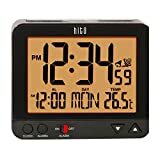 It has multiple display modes that can alert you about the temperature, different time formats, and the months and date. It even has a built-in stand so that you can quickly place it on a nightstand or even on the floor beside your bed. 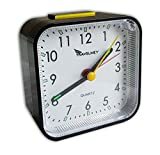 This clock folds up fairly well so that you can pack it away easily. The alarm isn’t too loud and disruptive; it’s just loud enough to wake you up. It allows up to two snoozes, which can be useful for some jetlagged users. The backlight doesn’t stay on all night. The alarm will automatically shut itself off after about a minute. Analog with quartz movement makes for some accurate timekeeping. 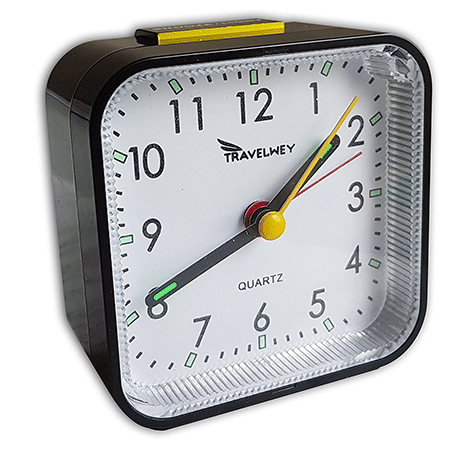 This Travelwey clock has both of these features; and as a result, is a great way to keep time during your trip. The casing on this is very durable, and it’s also very small for easy packing. This clock has a tickless design so that it won’t disturb your sleep. Its visual aesthetic is very attractive. The hands are luminous. Additionally, the clock also has an on-demand light. The light bulb is a little too bright. Our final clock has a small form factor, a silent operation, and a three beep, ascending alarm tone that gets loud enough to wake most sleepers. It’s also very durable, which is perfect for most travelers. Also, the snooze will continue until it has been switched off. The hands are luminous for nighttime viewing. You can’t set the alarm for A.M. or P.M. specifically. It doesn’t have a light. 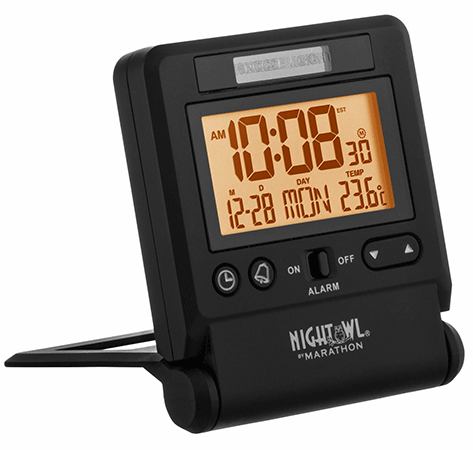 Travel alarm clocks can have a wide range of features. Do you prefer one that doesn’t tick? How about one that tells you the local weather? Do you like a nightlight? These are all features that you can find on one of these products, so it may take some due diligence for you to find the best product for your travel needs. One feature that many people like is a snooze, which can help you get up incrementally. 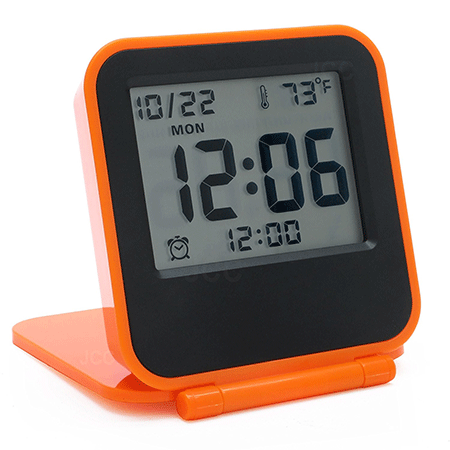 In any situation, let’s take a look at some great models of alarm clock. Each of the products that we’ve covered here is very useful when you’re out on your travels. They all have some great features that make them valuable in different situations as well. Hopefully, you’ve found the product that best fits your needs so that on your next trip you can be as productive as possible.